Awesome. Awesome. This guy would make a great Companion. Now that is pretty cool…..er warm…er cool…hot…NO! not hot, I mean, yeah, hot like with heat!! 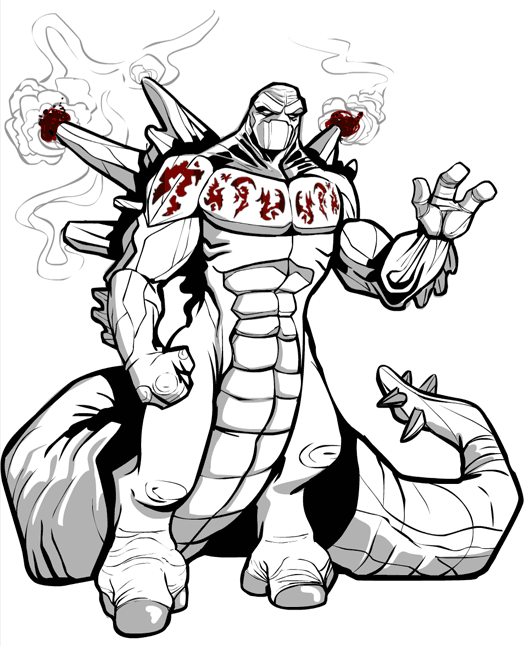 Not…..
Looks a lot like Humongasaur from Ben10 with a bigger tail and volcano spikes. Channeling Cartoon Network are we? Still though, great illustration. On the companion thing, I think this guy stands alone. I’ve never seen an episode of Ben10, whatever it is, but if it has something called a Humongasaur I might have to take a look. I think the tail is WAY too thick, but I like everything else. Ditch the tail and I think you’ll have a really cool looking monster. @Mr.MikeK: I meant make this guy available in the Companion section of HM3. We’ve moved from humans, to martians, to men in ant suits. Now here we have Rhino-golem, who I imagine either sleeps on his stomach or standing up. We’re moving forward, Loch Ness monster next? Sleep is for the weak. Rhino-golem uses the time when puny meat bags shut down their brains for eight hours to plot your doom. On the size of the tail, I imagined him ponderously dragging it through big lava tubes and underground caverns. This is not a quick creature. I thought of him as a combination of humanoid, rhino, and giant tunnel snake. I agree that this should be added to the companions section. It would be great! I like it a lot! @Jeff: if you want to know what humongasaur looks like, Google it. not that hard. @Fyzza: Wow, Google has a search function?! How cool! Honestly, sometimes you guys make my head hurt. That comment makes no sense, I can’t for the life of me fathom what would have prompted it. Yeah Fyzza, I have to agree, that was pointless and meen!! But I disagree with Danny and agree with Jake. I like the thick tail. It makes him look like he could bash some skulls, and is slow, which you said earlier. And this dude would liven up any dull HM3 character as a companion. Overall, this is a really awesome SOD, and I like the title. Reminds me of a Heatran given human form!. You can google Heatran, too. I especially like his shoulder and chest plates. @connor: It wasn’t intended like that? Jeff said he had no idea what humongosaur looked like, and had never seen an episode of ben 10, and I was just adding to what Mr. MikeK had said earlier. Lookaing back at it, the way i worded it seems wrong. Let’s do another critique day! and his name shall be Bob!